Business cards: the good, the bad and the ugly. An alternative title is “effective and ineffective business cards”. How effective is your business card? How often have you been at a networking meeting, collected business cards from the people at you table and then tried to figure out which card belonged to whom? If you cannot even make this connection when the person is still near you, what will happen when you get back to the office? If you are organised you might sort through your cards at the end of the week. “Now which one was Fred”?, you might ask yourself. Weeks or months later, you probably have no idea who the person is or what you talked about. You could always write a few comments on the business card : even date and the event can be quite helpful. It can seem rude to write on the face of the business card, so what about the reverse side? This is where graphic designers and brands can hinder if not block communication. In the old days, business cards often had a blank reverse, which was ideal for jotting down a few notes. Now we see fancier designs with the reverse taken up with a strong “brand image”. This can be a great way to convey your brand, but it can come at a high cost! Firstly, be very clear why you have a business card and what impression you want to give. Secondly, don’t let the graphic designer take control. Work out how you would like the person who receives your card to respond. What impression would you like to give? I copied this idea from the business card of a guy from Singapore, who I met in New Zealand after an introduction from an Indian, who was now back in Singapore. 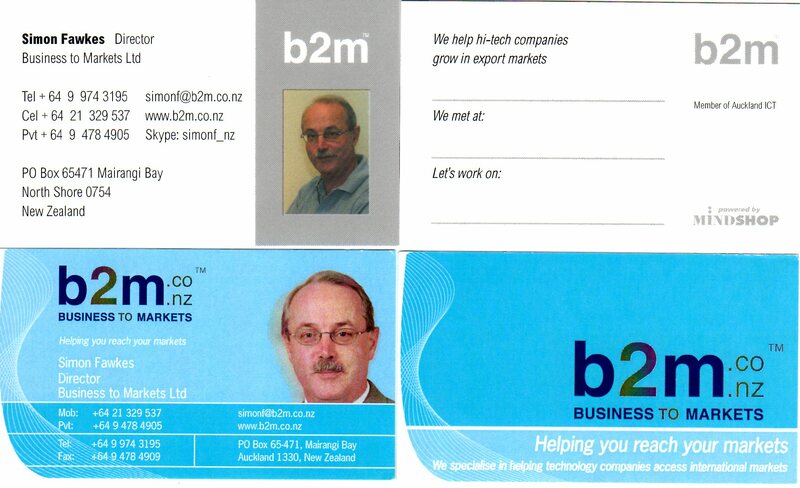 So next time you are at a networking function, look more closely at the business cards you receive. Observe too how others react when they get your business card. You might even want to get a new business card! very good suggestions. Sometimes I feel, that these kind of tips are both unique and extraordinary, in order to stand out in the crowd. Thanks. Many thanks for your kind words. How did you come across this post? I was reluctant to show business cards from other people, then I realised that the reverse of my old card was a great example of the “bad”. The “We met at:/Let’s work on:” thingy is fantastic idea. I will try to add it to some of my designs and see how people react to it. Thanks. Thank you very much for this helpful piece of content which im sure would have taken a long time to put together. Thank you very much for this delightful article of info which i believe would have taken a decent effort to put together.